With School finished for the summer, and still more than a month to go before our home leave was due, we decided to take a long weekend to visit Bohol. We stayed at the Bohol Beach Club, a well organized resort of some 70 rooms (with more building apparently underway) situated in beautifully manicured gardens behind a palm fringed beach of powder white sand and blue seas. The ‘superior beach front rooms’ were air conditioned with every convenience, but were perhaps let down only by their choice of bed linen, although for a mere four nights stay autumnal floral designs are a fairly insignificant complaint. A scattering of hammocks swung between the shady palm trees, perfect for ‘chilling’ after the stresses and strains that build up in Manila, and you can treat yourself to a massage on proper massage beds right there on the beach to help yourself unwind. There are two swimming pools, one incorporating a Jacuzzi, plus a games room offering billiards, table tennis, chess and Mah-Jhong. The weather was just perfect in spite of the season (early July) sunny mornings with a welcome breeze, and from the comfort of our sun-loungers in the late afternoon, we were able to watch the rain falling on far away islands while enjoying the rolling thunder and free light show provided by electrical storms. However we stayed comfortably dry with only a refreshingly light sprinkling of rain on a couple of evenings. The dive shop not only offers diving (some pool training was underway during our stay) but also Kayak hire, trips in a glass bottomed boat to view the beautiful corals just off shore, and island hopping trips to nearby Balicasag and Pamilacan Islands. Taking advantage of the diving facilities, we explored both the house reefs and some sites a 45 minute boat ride away such as Pamilican and Snake Island. While the currents here can be quite strong, they are definitely worth a visit from experienced divers, with healthy corals in Technicolor beauty, hump-headed parrotfish, Napoleon Wrasse, and more than 20 sea snakes varying in size from half a metre to some 3m in length.on the underwater island named after them. The visibility was some of the best I have seen in the Philippines, up to 25m of clear blue water, perfect for underwater photography! As we gently motored across flat seas to our dive sites under clear blue skies, fluffy white clouds shining over the distant islands, it became clear that the Philippine islands really are some of the most stunningly beautiful places in the world. Bohol is a mere 1 ½ hours away from Manila by air via Tagbilaran airport. A short drive to Panglao island (no boat trip needed to the relief of the family!) and we were welcomed to our resort. The island of Bohol is of course famous for many things, notably the Chocolate Hills, Tarsirs, allegedly the smallest primates in the world, and the Loboc river with its’ waterfalls, and many historic buildings. Although this trip was devoted to the beach, our first trip to Bohol a couple of years ago incorporated all of the above, plus a stay at another resort, the remote Balicasag island justifiably renowned for it’s diving. The resort itself seemed to have called a halt to any progress (or maintenance) after winning a prestigious award from the Philippine department of tourism in 1974, it was uncrowded, and very relaxing! We have been in the Philippines long enough to understand that such remote places frequently run out of such basics as SMB, soft drinks, Fruit, vegetables and so on, so while this inevitable phenomenon is frustrating, no advantage is to be had in kicking up a fuss. Better to simply shrug your shoulders and find out what alternatives are available. The diving was excellent, with large shoals of barracuda, and enormous numbers of tiny fish, known as dili, hugging the steep walls of the drop off. Our journey to visit the Chocolate Hills was also notable, not least for the inauspicious start when the van we were traveling in suffered a break down at dusk. Kind locals were eager to help, offering us shelter in their homes and chatting in the way that curious Filipinos have – where are you from? How many children do you have? What is your job? How long have you lived in Manila? Etc etc. When we arrived at the resort well after dark, we discovered that while its situation was perfect for catching the sunrise over this unique geological feature, it seemed to have been uncompleted, the builders having run out of funds some 20 years ago! The bare concrete walls and floors with Spartan cots provided, while clean, were hardly luxurious, leaving us with the sense that perhaps this is what it would be like to spend a night in prison! Still it was only one night, and the restaurant pulled out all the stops, determined to impress their foreign guests with their hospitalilty if nothing else. We slept well and in the early morning, climbed the 214 steep steps up the side of one of the hills to the most perfect viewing platform available. 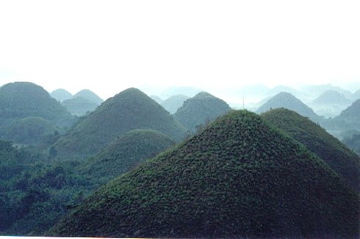 As the night melted away, the hills arose like islands from a sea of white mist. With the rising of the sun, pink shadows built up with striking effects, until with the sun well into the sky, the mist evaporated and the uniform greenish-brown hills appeared in every direction as far as the eye could see. Descending the steps for breakfast, we purchased the obligatory T shirts and pressed on with our tour, stopping at Baclayon church, considered to be the oldest in the Philippines, and San Pedro church in Loboc the second oldest church in Bohol. Lunch was served on a river boat as we motored gently up the Loboc river to visit water-falls, grilled prawns served on banana leaves and a salad of cucumber in mild white vinegar, followed by mango, banana and watermelon. Such a trip would not be complete without a stop to see some tarsirs. 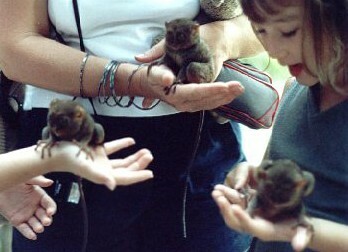 These tiny primates with their huge eyes and ears, and tiny hands and feet, are not to everyone’s taste, but with the adults sitting snugly in the palm of the hand, their tiny babies are undeniably cute. They live exclusively on insects such as cockroaches and crickets, but in captivity may even eat reptiles, bats, birds and fish. They are currently classified as ‘low risk conservation dependent’ but are highly dependent on protection programmes for their survival. 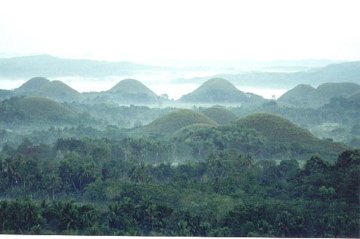 Bohol offers plenty of other things to see and do. Fiesta’s during July celebrate the Bohol Sandugo month and commemorate the blood compact between Raja Sikatuna, a local chief, and Captain Miguel Lopez de Legaspi, a Spanish explorer, on March 16, 1565. The highlights are the election of Miss Sandugo , and the Sandugo reenactment and street dancing competition. You can also explore some of the many caves that the island is famous for, go bird watching or even whale and dolphin watching. And when you’re tired of adventure, simply relax on the beach under the rustling shade of the coconut palms. Bohol is definitely worth a visit, wherever your interests lie. Don’t leave the Philippines without making the trip, it’s something you’ll never forget.